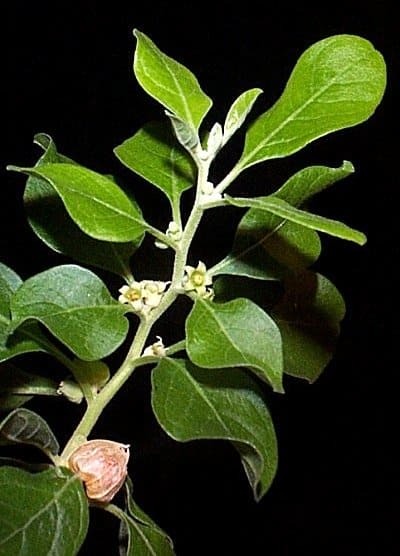 Ashwagandha is a shrub with a central stem from which branches, which are covered with a dense matte of woolly hairs, extend radially in a star pattern . 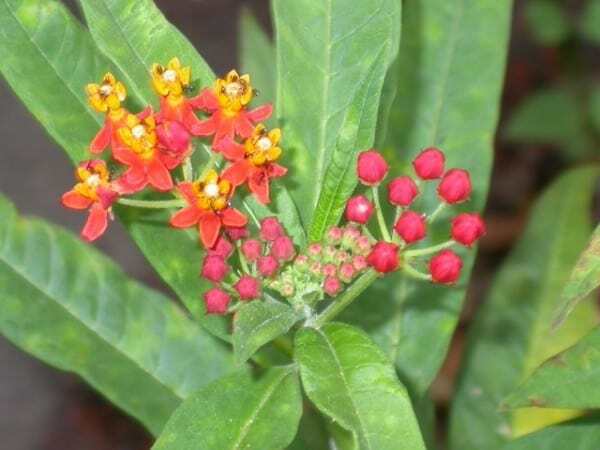 The flowers are small and green, while the ripe fruit is orange-red and has milk-coagulating properties. The plant’s long, fleshy, brown, tuberous roots are used for medicinal purposes. The plant has an average diameter of 9-12 inches, and grows up to 3 feet in temperate climates and up to 7 feet in areas similar to the countries it is native to (e.g., India). Their attractive berries are not edible. Children need to be educated not to eat the berries, as they can cause severe gastro-intestinal upset. Ayurvedic practitioners have been using Ashwagandha root for thousands of years as a powerful rasayana (a tonic for greater vitality and longevity). The herb has traditionally been used for calming the mind, relieving weakness, nervous exhaustion and arthritis, and for building sexual energy. 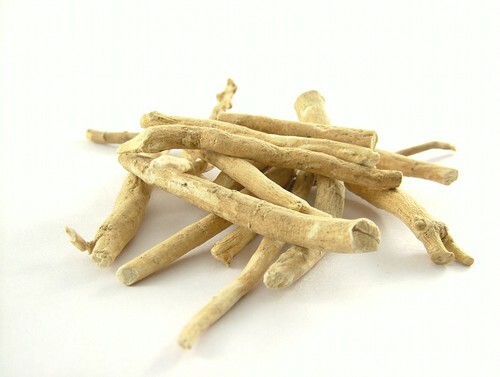 Ashwagandha root is beneficial to people who do physical labor or exercise a lot to help the body adapt to physical stress. The herb has also been used for strengthening the female reproductive system but should not be consumed when expecting. The bitter leaves are used as a hypnotic in the treatment of alcoholism and to relax the spasms of the lungs for the treatment of asthma and emphysema. They can also be made into an anti-inflammatory poultice and topically applied for boils and carbuncles. Internally, as with so many other strongly bitter herbs, they are anthelmintic (clearing worms). The seeds of the fruits are diuretic and can be used as a substitute for rennet to curdle milk. Place one to two Ashwagandha seeds into each compartment of the seed tray and press them gently into the surface of the soil. Do not cover the seeds with soil. Place the seed tray in a location that receives bright sunlight and maintains a constant temperature. Mist the top of the soil daily with water from a spray bottle and do not allow the top of the soil to dry out. If you prefer, you can fill a tub with 2 inches of water and set the seed tray into it to water it from the bottom. Wait until the Ashwagandha seeds germinate in approximately two weeks. Continue watering and observing the plants until they reach 3 to 4 inches high and transplant them outdoors to a location with full sun and sandy soil. While transplanting, be sure to leave 2 to 3 feet between each plant. Water well and keep the plants moist until they begin to show strong signs of growth. After that time, keep your ashwagandha fairly dry. The plant is ready to harvest in about 6 months. The author strongly recommends consulting an ayurvedic doctor on the correct usage of Ashwagandha for optimum results.